As the season opener approaches, all that's left to do is talk about the same things over and over again until game time. And the local news stations have been previewing the season by doing just that. This is a pack of reports focusing on the Longhorn's quarterback situation. There's interview footage with confident freshman QBs Colt McCoy and Jevan Snead, as well as some words of wisdom from senior safety Michael Griffin. Maybe it's me, but it looks like Colt McCoy might just have some fire in that belly. At the end of the clip, in a disturbing piece of video, Fox 7's Joe Bickett expresses his dissatisfaction with the name Godzillatron. But Godzillatron doesn't watch Fox 7 News and has never even heard of Joe Bickett. But when Joe Bickett reports from the field this year, Godzillatron will have the last laugh and poison his blood with ultraviolet radiation. Because that's how big Godzillatron is. In 2005, the Longhorns were faced with replacing tight end Bo Scaife who finished his career at Texas ranked second among tight ends for receptions and third all-time in receiving yards. But David Thomas did just fine setting an all-time Longhorn record for TEs with 50 receptions in a season and finished as the all-time leader in receptions, receiving yards and touchdowns. Senior TE Neal Tweedie will likely top the depth chart this year, but with four years of eligibility remaining look for Jermichael Finley to get plenty of playing time and to emerge as a playmaker for his team. 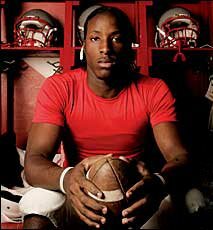 At Diboll (TX) High School Finley was a four year starter at TE but also played wide receiver, defensive end, safety, punter and kicker. He was named first team all-district, and first team 3A all-state by the Texas Sports Writes Association. 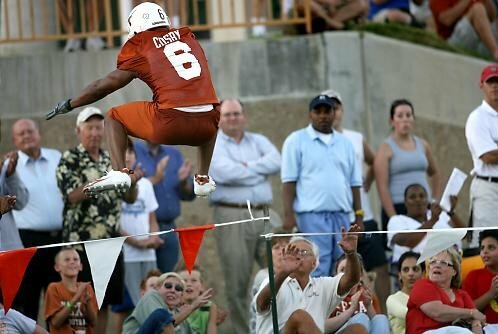 Leading up to the 2006 season, Finley has impressed coaches, teammates and casual onlookers with his sure hands and great leaping ability. 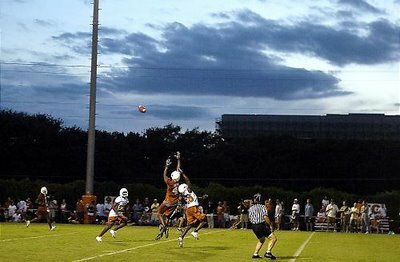 He's put on thirty pounds since high school and at 6'5" and 240 pounds, he has the size, speed and athletic ability to become the Longhorn's next great tight end. These highlights from the 2005 THSCA All-Star Game should serve as a glimpse of what's to come. This is the last collection of news reports from last week's pre-season practices. It includes pieces on the wide receivers Quan Cosby and Nate Jones. Both receivers are interviewed along with WRs Billy Pittman and Limas Sweed. There's also a report on the defensive line that includes interviews with Brian Orakpo, Brian Robison, Frank Okam, Tim Crowder and Mack Brown. You can find the first three collection of reports here, here and here. 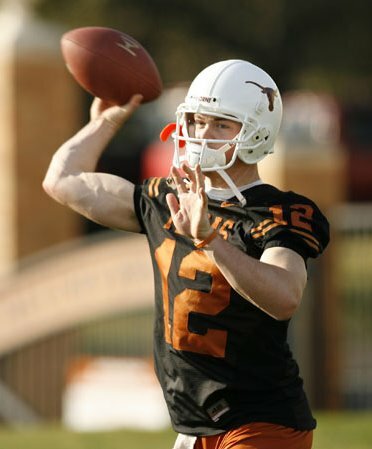 Can Colt McCoy Really Lead the Horns? 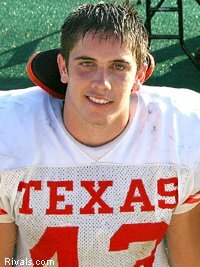 or: Is Colt the Best Texas 2A High School QB Ever? Well we know he can swim, but can a guy from a 2A high school actually be the starting quarterback for the defending national champs? Colt McCoy, from Jim Ned HS (Tuscola, TX), is the all-time leading passer in Texas 2A history and also ran 206 times for 1,575 yards (7.65 ypc) and 21 TDs. In his last two seasons at Jim Ned, Colt threw for 7,745 yards with 97 TDs (the 50 TDs in his junior year is an all time Texas 2A record). He was a two-time Associated Press 2A Offensive MVP and first-team all-state selection. The Texas Sports Writers Association twice named him to the first-team all-state team and made him the offensive player of the year after his senior year. I'd imagine we'll know a whole lot more after the Ohio State game, but his impressive resume and these videos should bring comfort to even the most worried fan. You can see from these Zapruder-quality high school highlights that McCoy is comfortable under pressure, he can throw with touch, he can scramble and he has the poise to consistently march his team down the field. Texas fans woke up extra early for the Longhorns' fan appreciation day and public scrimmage. Colt McCoy looked like the starting quarterback with two TDs in his two drives. He went 5 for 6 for 68 yards with a nice 44-yard pass to Limas Sweed. Jamaal Charles and Selvin Young each rushed for a TD and both backs looked sharp. The offense looked good, but the defense looked downright fierce. CB Erick Jackson had the hit of the day when he leveled Billy Pittman while Pittman bobbling a quick pass. Jackson hit him so hard his own helmet flew up the field. Pittman still made the catch. And freshman safety Robert Joseph had a highlight-reel interception on a nice pass by Jevan Snead to Billy Pittman. All of those plays are included in this collection from the day's news coverage which also includes a charming live interview with Kerry Campbell, father of Texas linebacker Jeremy Campbell. 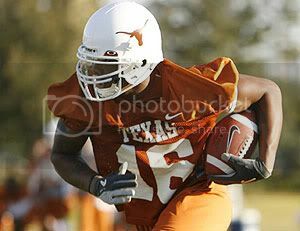 Here's some more news coverage from last week's Longhorns practice sessions. This clip features interviews with Selvin Young, Jamaal Charles, Quan Cosby, Billy Pittman, Greg Davis and Mack Brown. It's a collection of news reports covering topics like practice in the summer heat, the running backs, the wide receivers, Tim Crowder's hometown connection to Earl Campbell, and a rare interview with Longhorns legend Roosevelt Leaks talking about his induction into the College Football Hall of Fame. Mack Brown appeared today on Fox Sport's The Best Damn Sports Show Period. 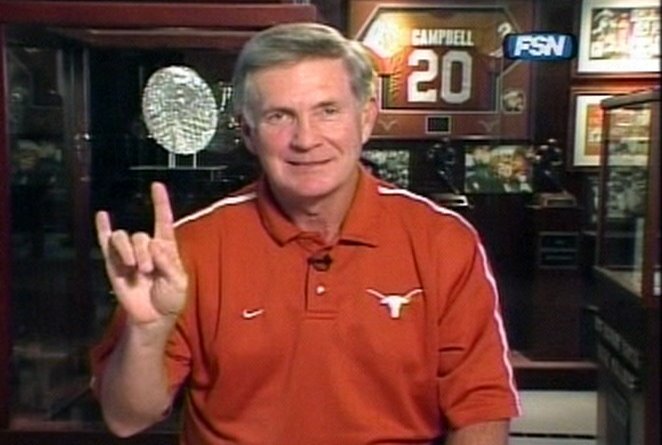 He talked about the Longhorns' victory over USC in the Rose Bowl for the national championship, the upcoming season and Vince Young's cow milking appearance on the show earlier this year. Watch until the end of this clip to see Vince Young waving from the audience. The day after ESPN featured Cedric Benson in a "Difference Maker" segment, the former Longhorn standout left practice yesterday on a cart with a shoulder injury. The injury doesn't seem too serious, but it certainly won't help Benson in his bid to earn the starting job for his Chicago Bears. That's the focus of this ESPN piece that ran just before his injury. This is a great collection of highlights from Benson's Longhorn career. And his best runs from his rookie season in the NFL. New Scoreboard Goes Up, Joe Jamail Statue Comes Down... and Whatcha Gonna Do About it Fatboy? The THSCA All-Star game was held at Royal Memorial Stadium earlier this week. While there, I got my first look at the new scoreboard and I noticed something... It's really big. When it's complete it will be the world's largest high-definition screen until later this year when a Japanese horse track proves that everything is bigger in Texas, unless you have more money to spend. You can't really blame them though, in Japan the horses are too tiny to be seen with the naked eye. Either way, the new scoreboard will still be the biggest one that anyone I know has ever seen, and they say it'll be ready by September 2nd for the home opener against UNT. The above picture is a live shot of the new scoreboard from the DKR-Texas Memorial Stadium Scoreboard Webcam, where you can also see a series of photos in time-lapse. This video shows a view from the stands with some shots of the construction area and the parts to be installed still in their giant boxes. 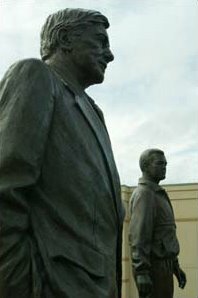 And this video shows that the statues of coach Darrell K. Royal and billionaire attorney Joe Jamail have been removed from the stadium. Gee, I sure hope somebody has cleared that with Joe. He can get kinda nasty when you cross him. Just take a look at this video from a 1980s deposition where Jamail (off camera to the right) questions a former research scientist, loses his temper and then calls him fatboy. As a kicker, Hunter Lawrence earned a rare scholarship from Mack Brown and might even earn a starting job as a true freshman. Over his last two years at Boerne (Texas) HS, Lawrence hit 87 of 91 PATs (%96) and connected on %73 of his FG attempts. He had 20 FGs (a Texas-state record) as a junior with a long of 48 yards, and 12 more as a senior (more than half of them over 40 yards) with a long of 49. He was a two-time all-sate selection and is considered by many to be the top high school kicker in the nation for the class of 2006. Lawrence could be that rare impact kicker at Texas and help bring some needed consistency at the position for years to come. "He has a really strong leg and I think he's only going to get better, that's the scary thing." "When we want to kick it deep, he gets it into the end zone consistently. He's got a really strong leg on kick-offs also." "He really works to improve himself and in the spring he really works to get stronger. He's a great kid and I'm very proud of him." At this week's THSCA All-Star Game, Lawrence boomed his kickoffs, hit all four extra points (one was even partially blocked) and in mid-scramble, got off a beautiful kick and placed it nicely down on the four yard line. 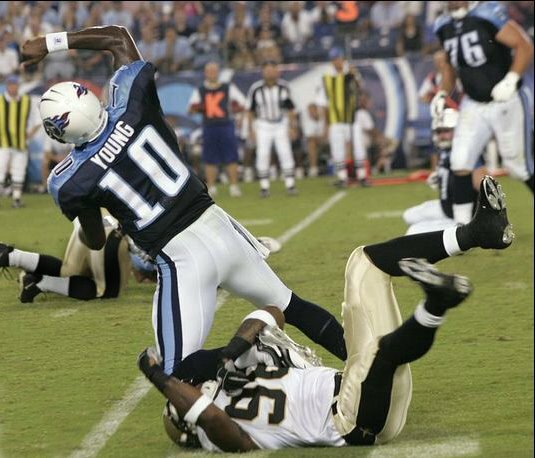 He went on to nail a 41 yard punt into the wind with a hang time of four seconds and showed toughness while trying to salvage a bad snap with half a team of all-stars chasing him down. You gotta love a kicker who can make the big play. 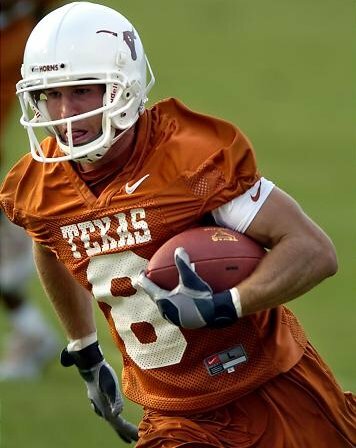 Former Texarkana linebacker Dustin Earnest will suit up in his Texas High uniform for one last game before he puts on his nearly identical Texas Longhorn uniform later this year. Earnest will join nine other future Longhorns tonight in the THSCA All-Star Football Game at Texas' Royal-Memorial Stadium.